Offering its 12 guests a sophisticated introduction to France’s captivating pastoral lifestyle, the experience aboard La Belle Epoque references the bygone era for which it is named – a “golden era” of artistic expression, cultural innovation, and regional optimism. A two story barge with a classic design, La Belle Epoque’s nautically inspired décor features traditional wood-paneling, rich teak, and polished brass. The lovely cabins range in size and bed configurations, ensuring the perfect stateroom for everyone. Guests socialize and relax on the expansive deck or in the hot tub, perhaps while enjoying a glass a wine from the Chablis vineyards, all the while watching the magnificent scenery of rolling vistas and grand cliffs gently slip by. When not being pampered onboard by the attentive crew, active passengers are encouraged to take a scenic stroll or leisurely bicycle ride along the canal’s marvelous towpaths. Crafted by the onboard Chef using local and seasonal ingredients, menus highlight the region’s familiar flavors through a contemporary presentation, while meticulously selected wine pairings at lunch and dinner are often from the region’s iconic vineyards. 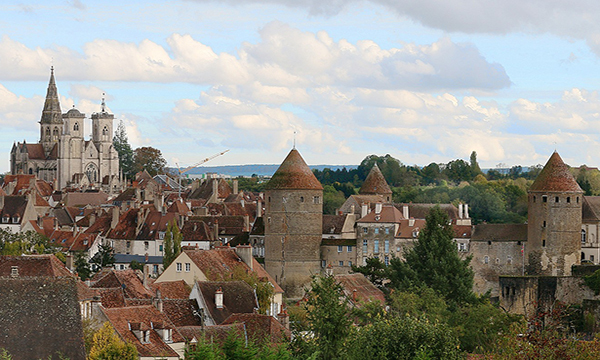 Sightseeing is vivid and lively, reflecting much of Northern Burgundy’s cultural depth and natural beauty, including excursions to charming market towns, private tours of local landmarks, and visits to historical attractions. In the afternoon, you will be met by a La Belle Epoque crew member at the designated meeting point. From here, relax as you are chauffeured to La Belle Epoque, moored in the town of Venaray les Laumes. A traditional champagne welcome and introduction to the crew awaits you, before your first gourmet dinner onboard. A morning cruise through vast woodlands and rolling fields comes with ample opportunities for walking and bicycling as La Belle Epoque gently floats past tiny canal side villages. This afternoon, your Tour Guide will take you to the delightful village of Flavigny sur Ozerain, where the film “Chocolat” was set. You will also visit the summit of Mount Auxois, where European history is revealed at Alesia, the site of the final battle between the Gauls and Romans in 52 BCE. Return to the barge for a festive evening of drinks and dinner. A morning cruise encourages a leisurely stroll or gentle pedal along the towpath. This afternoon, your Tour Guide escorts you to the UNESCO World Heritage site of Abbaye de Fontenay, which was founded by St. Bernard in 1118. As a distinctive example of early Cistercian architecture, Fontenay allows an exceptional glimpse of a devoutly religious life, with its peaceful gardens, placid ponds, and stately structures. After a thorough visit, return to the barge for an evening cruise. Chef presents tonight's gourmet dinner onboard. This morning, your Tour Guide accompanies you to Les Riceys, the only wine growing area of the Champagne region to have 3 Appellation d’Origine Contrôlées. Visit the Maison Alexandre Bonnet for a private champagne tasting, cheers! Then, it's but a short drive to Chateau de Ricey-Bas. Here we will be greeted to a champagne aperitif and a gourmet lunch with the chateau’s Baroness(! ), after which there is time to stroll the gardens or explore the interiors. Return to the barge for a late afternoon cruise. Chef presents dinner onboard. This morning's excursion to the Renaissance chateau of Ancy le Franc is a cruise highlight. Renowned for its 16th-century wall paintings and frescoes, which arguably rival those of Fontainebleau, Ancy le Franc has been sensitively renovated and restored. Explore the chateau's grounds, gardens, and parklands. Return to the barge for La Belle Epoque's lazy afternoon cruise. Socialize on deck and watch the beautiful Burgundian scenery slip by while Chef crafts another gourmet dinner. A morning cruise provides the opportunity to bicycle or walk to the charming village of Saint Vinnemer. Your Tour Guide introduces you to the iconic vineyards of Chablis this afternoon. Meet the viticulturists who expertly grow the pampered grapes from which this white wine is exclusively produced. Visit a winemaker such as the family-run Domaine Régnard, where samples of the vineyard's vintages are of course offered. Return to the barge for cocktails, canapes, and the Captain’s Farewell Dinner. 25% discount on private charter bookings for the following 2019 cruise weeks: April 28-May 4, May 12-18 and 19-25. 10% discount on private charter bookings for the following 2019 cruise weeks: June 9-16, July 7-13 and 14-20. 20% discount on cabin bookings for the following 2019 cruise weeks: April 21-27, May 5-11 and 26-June 1, June 16-21 and June 30-July 6.